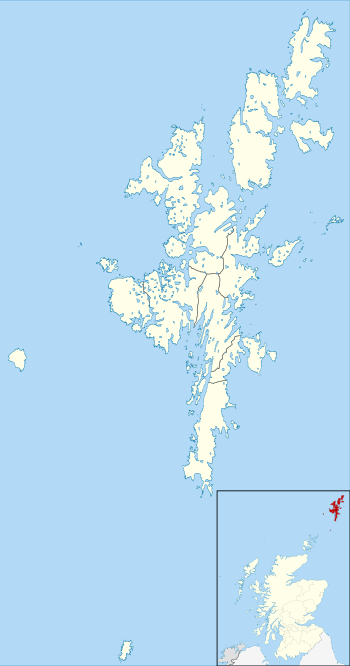 Northmavine or Northmaven (Old Norse: Norðan Mæfeið, meaning ‘the land north of the Mavis Grind’) is a peninsula on the northernmost part of the Shetland mainland in Scotland. The peninsula has historically formed the Civil parish Northmavine. The modern Northmavine community council area has the same extent. The area of the parish is given as 204.1 km². At the census of 2017-03-27, the population numbered 741, yielding a population density of 3.6 per km², which is the second lowest in Shetland, after Fetlar. The peninsula includes the northernmost part of Mainland, and the civil parish, spelt Northmaven, comprises a number of adjacent islands, and measures 16 miles (26 km) by 8 miles (13 km). Northmavine is in the north west of the island, and contains the villages of Hillswick, Ollaberry, and North Roe. An isthmus, Mavis Grind (Mæfeiðs grind), about a hundred yards across, forms the sole connection with the rest of Mainland. The coast is indented by numerous bays and consists largely of high, steep rocks. It has a number of high, fissured, cavernous cliffs on the west coast and consists of many skerries, islets, and offshore rocks. The interior has a very small amount of arable land; it consists mostly of rough, rising ground, including Ronas Hill, the highest point in all Shetland. Esha Ness Lighthouse is situated on the Northmavine peninsula. Tangwick Haa Museum preserves the history of Northmavine. Remains of ancient watch houses and remains of barrows and forts are also numerous. This article incorporates text from Wilson, Rev. John The Gazetteer of Scotland (Edinburgh, 1882) Published by W. & A.K. Johnstone. Wikimedia Commons has media related to Northmavine. This Shetland location article is a stub. You can help Wikipedia by expanding it. This page was last edited on 28 March 2019, at 09:24 (UTC).